Tony Pearce at Herford Junior School, Brighton. In the school where I work, for the last two years we have been implementing a programme called Working With Others; this focusses on enabling children to develop strategies that allow them to more effectively master skills of collaboration, cooperation, problem solving and solving inter-group conflict productively. Both staff and children have had timetabled sessions where they work on the skills they need to master to become effective both as individuals and members of a group: skills of communication, compromise, role designation, improvisation and flexibility, amongst others. As the staff member with responsibility for organizing football amongst the children, I had the chance to observe behaviour first-hand that illustrated the abilities and skill sets we were trying to foster amongst the children in a football setting. 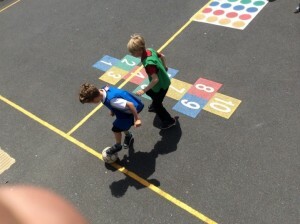 Football had disappeared from our school playground. It had been absent for so long nobody even questioned its banishment even more. When I raised a meek query, there seemed to be a list of problems associated with the game which made its exclusion irrefutable: It dominated the playground, sprawling across space in a way which made other activities impossible; the games invariably ended up being controlled by an elite – the oldest, biggest, most skilful boys; it generated bad behaviour – arguing, cheating, aggression etc. But still, in the corners of the playground away from adult vigilance football persisted: tennis balls, netballs and even cricket balls were being kicked by children obviously hungry to play football. Surely there had to be a way to reintroduce the game? So, I drew up a plan to put to our Head: Football in a small, contained area of the playground; controlled numbers, equal access for all children and no scope for one group to dominate. 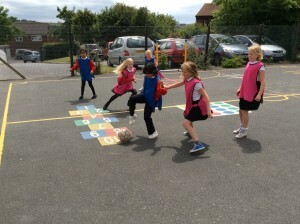 The format was to be 3v3 on a small pitch. Three teams wearing coloured bibs, two teams on, one team off and a single goal decides each game. Aside from the first game when winner stays on, each team stays on for two games then goes to the side-lines regardless of results. 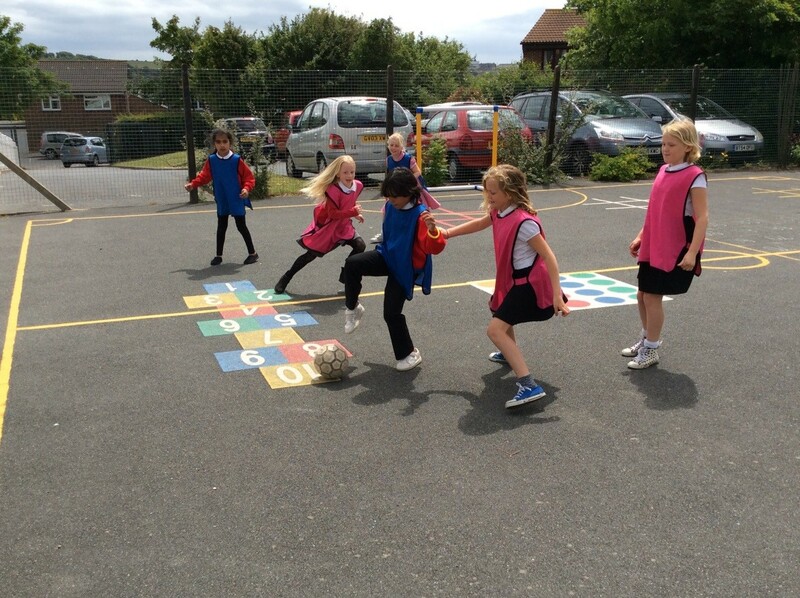 Access to the game was on a strict rota: lower school girls, lower school boys, upper school girls, upper school boys to allow every child an opportunity to play amongst their peers. Pleasingly, the Head agreed to it. It was an experiment; it cost nothing, so there was nothing to lose. Schools work better when children are happy and this undoubtedly made the children happy. They were given a brief overview of how the game was to be run at a school assembly and they were left in no doubt that if the experiment failed, football would once more disappear. To re-start our stalled Year Six Boys team an open trial was to be held, where any interested boy could play. Initially we had eighteen players which was ideal; so I picked two evenly matched teams of nine (based on my knowledge of their abilities). However, come the day of the game we were down to twelve players. Three had dropped out from each side for a variety of reasons, but unfortunately one team had lost three of its strongest players, the other three of its weakest. Once the match started it soon started to follow a predictable path – one team dominating and scoring at will the other barely able to get out of its own half. It was as unsatisfying for the winning team as it was dispiriting for the losing. At half time I gathered the players in the centre circle and asked “Is this working?” then took a step back and left them to it. Quickly and without fuss a calm discussion was held amongst all of the players, bibs were swopped and the teams were re-shaped into two evenly matched groups who proceeded to play a meaningful, competitive and wholly enjoyable second half to the game. All of the players had an input, everyone was listened to and important decisions were made quickly, fairly and efficiently. 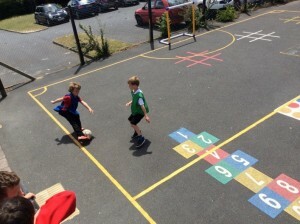 The second example is from the playground: Initially I took a hands-on role with the games, refereeing them from a position looking down on the pitch. During one game I adjudged a player had taken the ball over the touch line, conceding a kick-in to the other team. The child looked at me appealingly but didn’t argue (no doubt aware that football in the playground hung by a slender thread) The player from the other team who had been awarded the kick in went to the touchline rolled the ball inches into play then deliberately dragged the ball back out of play – giving the possession back to the team that had wrongly been robbed of it by my interference. The children had been presented with a complex moral problem- was it right to gain an advantage over the opposition through mistaken (and misplaced) refereeing? The children managed to both respect my authority (by taking the kick-in I had awarded) and impose and maintain their own code of fairness and justice by disdaining any unfair advantage. 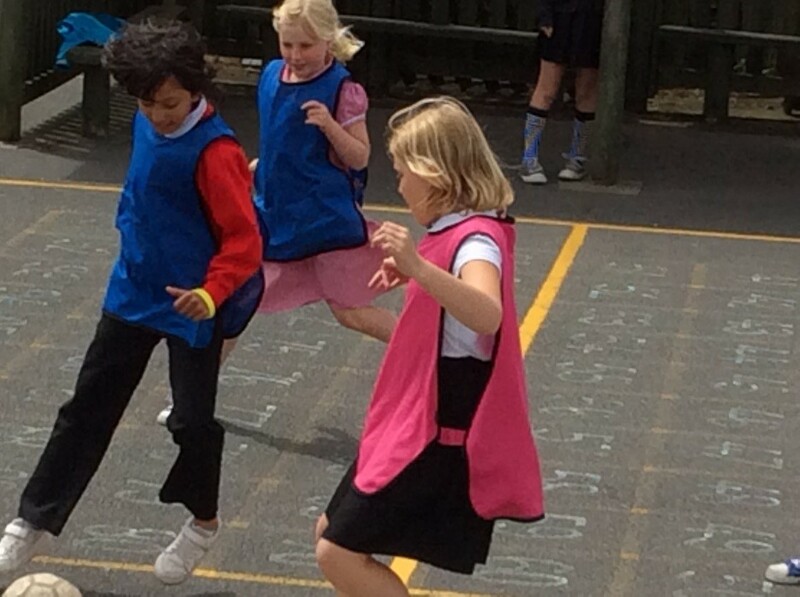 At that moment I realised it was time to let the children run the games themselves as much as possible! The rules of football provide a framework for meaningful play –unless the rules are followed a game disintegrates until there is nothing left. That is not to say there are not disputes – there are. But if players know that play stops until a dispute is settled satisfactorily they get pretty rapid at conflict resolution. When everybody else is waiting to carry on play, then spurious claims for “My corner!”etc. are soon abandoned in favour of continuing the game. If two players legitimately believe their claim is valid and nobody is backing down it invariably goes to ‘rock-paper-scissors’ to solve the insoluble. In a world where children are all too often taken (driven) from one adult-led activity to another, the opportunity to practice these skills of negotiation and problem-solving are fewer. Our children are being de-skilled. In my experience, football has provided a framework for children to exercise some autonomy from the adult world; they take responsibility for the kit and equipment, they make decisions regarding infringements, they keep score, they referee. A generation ago these skills would be commonplace in children, but now, in a world where street-play has all but disappeared these abilities must be nurtured if they are not to be lost. “I am sure those games instilled in me and my pals a sense of responsibility and a notion that one had to adhere to rules in life if you were not to spoil things for other people. We had no referee to apply the rules of the game. When a goal was scored we restarted the game with a kick off from what passed as a centre spot. When a foul was committed, a free kick was taken and no one took umbrage. 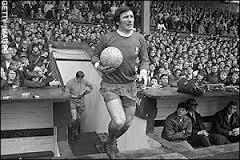 We seemed to accept that if anyone did not play by the rules of football, the game would be spoiled for everyone.